Cancer has no compassion, no pity, no conscience and no mercy. It will attack the body causing damage that is life threatening leaving many unable to work, with a diminished quality of life, in pain and unable to survive. The treatments for cancer can be as damaging as the disease itself but is needed to vanquish the disease from one’s body. Treatments like Immunotherapy, Chemotherapy, Radiation and Surgery can leave a person unable to work causing other problems like financial hardships. One local family that experienced this personally decided to make a difference to help others in this fight. The Burchett family or Team Burchett knows the devastating effects of cancer living through it themselves. In honor of husband, father and firefighter Robert Burchett, who was diagnosed with Cholangiocarcinoma, a liver bile duct cancer, started a mission to raise funds for local cancer patients that are unable to pay their bills. They witnessed firsthand the struggles many cancer patients went through seeing it in the hospital themselves when Robert was being treated or Roberts’s wife Patrice as a career paramedic in Cecil County. 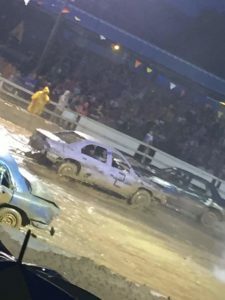 Using the Cecil County Fair’s Demolition Derby as the venue, Team Burchett devised a means to raise funds for others. 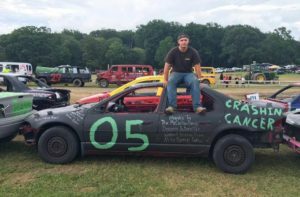 Their plan was to find 2 cars to run in the derby in hopes to raise sponsorships for the fight and a dream of winning the big prize as champions of the derby. Getting the two cars was the easy part. Now the team had to spend countless hours stripping them down to make them safe to compete. Promotions were used to get people involved and to learn more about their cause. They spent months getting ready for the big event and sure enough Mother Nature threw a twist and made sure on the day the cars would run, they would run in the mud. The first heat was run in the afternoon and Tyler Burchett, son to Robert and Patrice, drove the 05 car. The field had 12 entries and the beating and banging began as soon as the clock reached zero. Driving a stripped down Plymouth Breeze, donated by Dynamic Automotive, Tyler was quick to make it known he wouldn’t get knocked out without a fight. After ten minutes of metal smashing and tires smoking the rain came and the field of dirt became a bowl of mud. Equipped with two flat front tires Tyler was able to survive until his car got stuck in the mud. Finishing 5th overall in his heat, he placed well and showed a strong finish for Team Burchett. Patrice was lucky enoug h to get the second heat, driving the #2 Chevy Lumina, which was donated by Skip McClellan, a regular Derby participant. It had rained hard all afternoon and 6 inches of rain had fallen in a short period of time. The concrete barriers were holding firm, filled with Mother Nature’s gooey, slippery, sticky, mess of a derby track. In this heat you didn’t have to only worry about an opponent knocking the radiator out of your car, you also had to worry about what would fly in and smack you in the face. Derby cars have no windshield or glass so the driver only has a pair of goggles to protect their eyes. A quick spin could leave a driver blinded for a few precious seconds leaving them vulnerable. Even with a stacked field of 16 cars, Patrice was able to handle a crowded field, mother nature and her own emotions to get a 3rd place finish! Although Team Burchett did not win the top prize their venture is considered a success. They raised awareness with their campaign by getting the word out that there are people in need and anyone can help. They raised over $1600 that will help those that have felt the sting of cancer in their world. Furthermore, it was a celebration of life, as Robert has beaten all odds and is still fighting the fight. Given a 6 month window to live Robert just passed the 3 year mark and has not given up hope. This event, this fund raiser and this family gives everyone hope that miracles are possible and to never give up. That commitment and confidence in life is the strongest weapon we can have so we don’t give up. Team Burchett!!! No one fights alone!